The monastic ideal of contemplation is very much alive today. Abbot William, founder of the Maronite Monks of Adoration, recounts his own journey through the tumultuous '70s and '80s to find this ideal. The monastic ideal of contemplation is very much alive today. Abbot William, founder of the Maronite Monks of Adoration, recounts his own journey through the tumultuous '70s and '80s to find this ideal. Follow the abbot as he navigates through Rogerian psychology, pop theology, and mere humanistic ideologies that invaded the Church. The modern world's compromises ultimately cannot satisfy the pangs of a contemplative heart. 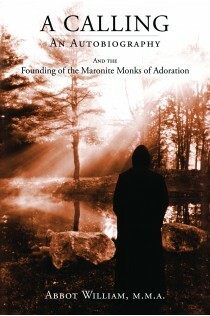 The abbot's journey is one of finding peace with fidelity to the monastic idea of adoring the Lord. The Maronite Monks of Adoration were canonically approved by the Vatican and established in the Eparchy of Saint Maron in 1989. Father Benedict J. Groeschel, C.F.R. +Most Rev. Francis M. Zayek, S.T.D., J.C.D.